Best quality, price, and service! That’s what you get with Truck & Auto Elegance. Tonneau covers, hard and soft cover products, installation, and repair. 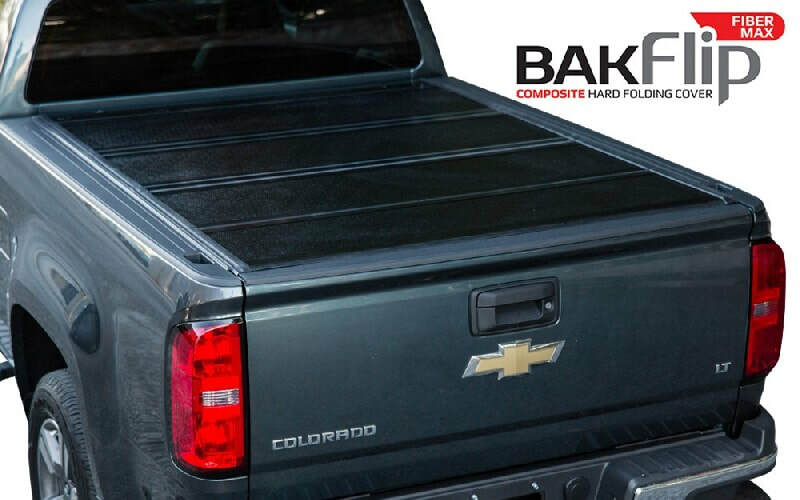 With a complete line of Access, Bakflip, Extang, Lakeland, Truxedo, and UnderCover truck bed covers, your options are limitless. Rollup, flip, and hinge action systems provide security for your bed with easy access to your cargo. Custom and factory options are designed to enhance your truck’s appearance. Stop into our Waukesha location today. We offer a full line of cost-effective, great value enhancement and accessory options for your personal or commercial truck needs. The Access® Lorado® Rollup Cover is a sleek, lower profile version of the original Access Cover. The low profile angled rails provide a streamlined design with all the same must-have features of the Access cover like all aluminum construction, roll-up bars and bows and UV resistant double coated vinyl fabric. The tarp stays flexible in any weather, even 40 degrees below zero, which means easy opening and closing. The Access® Lorado® cover also keeps your cargo secure and protected with its automatic latching system and manual slide lock. The exclusive XT-Dial™ Tension adjuster lets you set cover tension with the turn of a dial, no tools needed. 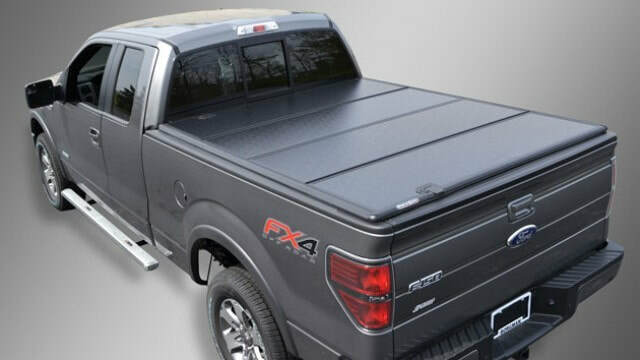 A bed cover that is barely there, the all new, all sleek Access® Vanish® Tonneau cover brings great tonneau features like all weather coverage and better MPG and yet lies only ½” above the truck box. It is the lowest profile cover that comes with the lowest price. Standard components such as the hook and loop sealing system and handy trigger release are hard to overlook. Extra Element Seal™ gasket at front of truck bed provides additional protection. The XT-Dial™ Tension adjuster to enable direct tension control with the turn of a dial. Keeps your cover drum tight. 2 convenient adjustable straps made of durable 3/4″ webbing. Two slide locks work with your locking tailgate to give you additional protection. Get a whole lot of tonneau without breaking the bank. The Access® Literider® tonneau cover gives you more without sacrificing features or built-to-last components. Access® Literider® Roll Up covers have all aluminum construction, roll up bars and bows and UV resistant double coated vinyl fabric . The EZ-Dial™ Tension adjuster lets you set cover tension with the turn of a dial, no tools needed. The smooth 1 ½” hook and loop and Quick Clip™ storage straps mean there are no snaps or debris catching tracks to get in the way. The automatic latching system and manual slide lock also keeps your cargo secure and protected. Extang engineered with precision. 45º steel corner brackets, commercial grade rails and I-Beam style Monster Bows provide unparalleled strength. SafetyKlamps: Extremely strong glass-filled nylon construction, will never break. Secure cab section by hand tightening thread clamps with built-in heavy-duty handle. MaxHinges: Ultra-strong, rugged, double pivot design made of durable glass-filled nylon and feature protective padding. Heavy-duty luggage style Hold-Tite fasteners secure the tonneau in the open position at the cab. 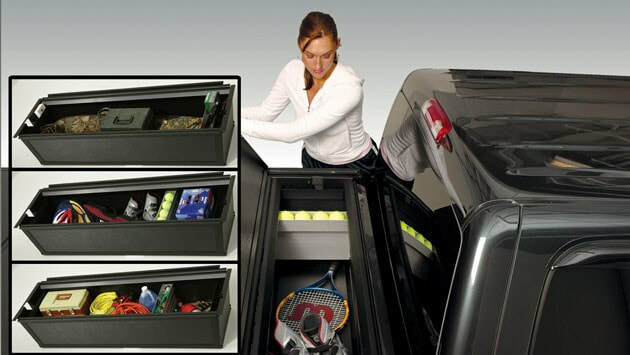 Provide quick and easy storage when hauling large cargo. The Trifecta offers two fabric options; traditional heavy-duty commercial grade vinyl, or the new Signature-Series with rich looking vinyl-backed black canvas. eMAX Tonno is the only soft-folding cover that folds up at the front of the truck bed to offer access to 100% of the bed interior. eMAX installs in minutes, and whether it’s open to full capacity or closed, remains hassle free and good looking. eMAX Tonno uses our patented Secure Shut latching system to keep the cover steady and cargo protected. eMAX Tonno is based on the number one selling Trifecta platform, featuring the same superior components: Speed & Safety Klamps, MaxHinges, WeatherTuff Seals and I-beams bows. eMAX Tonno, like all Extang products, is proudly made in the USA with the best materials and attention to detail. We back our work with our Maximum Strength Lifetime Warranty. The sleek black, well tailored looks of the TruXedo Lo Pro QT Tonneau Cover bring to mind a formal affair. Yet, the industrial-strength, vinyl-coated, leather-grain fabric, lifetime warranty and tailgate locking capability let you know it’s ready for action. No other tonneau on the streets today mounts as fast as the TruXedo Lo Pro QT. Installation takes only 20-30 minutes, and the cover can be completely removed and reinstalled in just a few seconds when you need your entire bed for hauling. Thanks to the new exclusive positive-lock header guides, your Lo Pro QT can be installed and removed with no drilling or even the use of tools. Say goodbye to sag. The innovative Velcro “floating hook” technology allows the rail-side seal to move or “float”, back and forth. With the addition of the automatic tension control plungers, the Lo Pro QT stays tight even in fluctuating temperatures, so the elements stay out and your truck bed stays dry even in extreme weather. And, its black-tone aluminum bows and side rails complete the look. Put it all together, and the TruXedo Lo Pro QT dishes up greater gas mileage, all-weather cargo protection and an eye-catching look. Made in the USA and backed by a Lifetime Warranty. 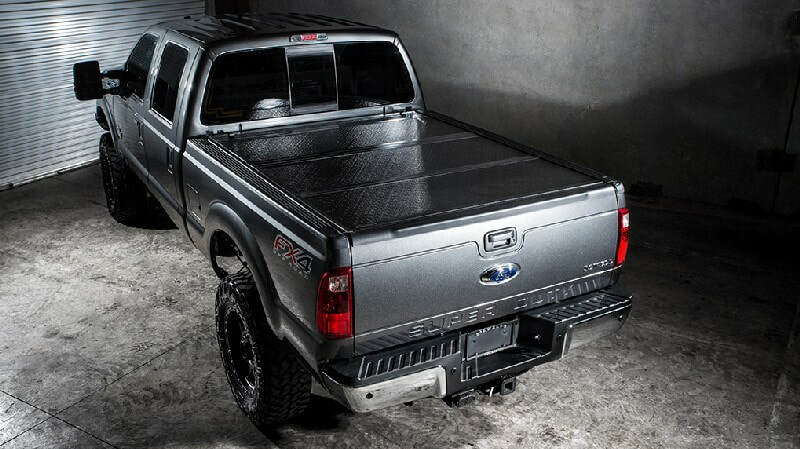 Your new TruXedo Edge Tonneau Cover goes on in 25-30 minutes with its no-drill, clamp-on installation. Plus, the adjustable tension control doesn’t require tools and makes it easy to keep the cover tight. Accessing you bed is simple too. The TruXedo Edge has a one-finger release that quickly and easily opens the cover. 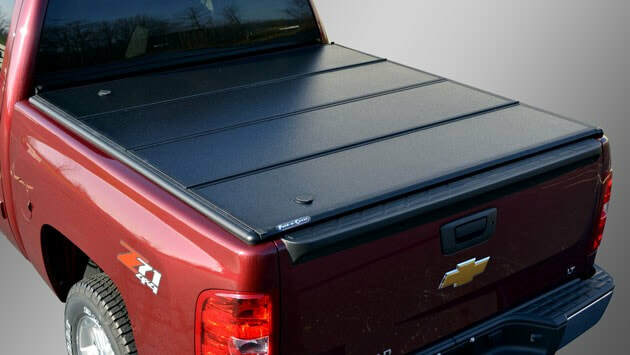 Protect your gear while adding the great look of an Edge Tonneau Cover to your bed today. It’s specifically made to fit your vehicle and backed by a 5-year warranty. Say goodbye to the “covered wagon” look of other tonneaus-the TruXport utilizes a system of straight bows that lay flat for a superb flush fit. Plus, these bows are attached to the heavy-duty vinyl tarp for roll-up use of your entire truck bed in less than 30 seconds. Lock it closed for extra security-the TruXport Tonneau features a latching mechanism that can only be released from underneath; perfect for locking tailgates. The TruXport truck bed cover has a new dual latch system with pre-set tension control integrated into the latch to provide easy and smooth operation. Installation takes only 20-25 minutes, and requires no cutting or drilling. 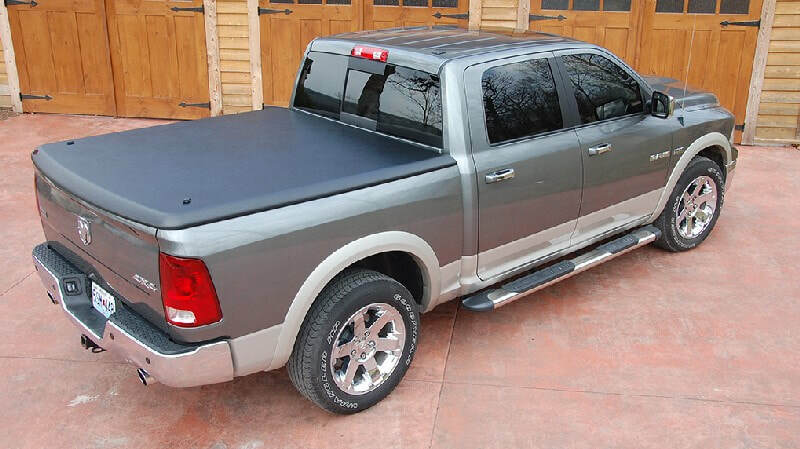 Your TruXedo TruXport Roll-Up Tonneau Cover is backed by a 5-year warranty. The G4 Elite is the latest model in the long line of innovative Fold-a-Cover products. It’s upgraded flush mounted latch handles allow you to open the cover and access the cargo area with two fingers in less than 2 seconds! The best part? Like every Fold-a-Cover before it, you can open your cover without having to open your tailgate. The BAKFlip MX4 has a premium density core which makes each panel stronger and more rigid, while adding virutally no additional weight per panel. The aluminum surface features a beautiful matte black finish with enhanced UV protection and advanced scuff and scratch resistance.